Delicious pastas, freshly caught fish, and mouth-watering pizzas are tasty enough to make you think you're dining along the sea in Naples or Sicily. Of course, the vista at Ristorante Il Teatro is just as spectacular: Most tables offer a front-row view of Wynn Macau's Performance Lake and its nightly fountain show. Two private, lake-facing dining rooms are also available for special events. Against this breathtaking backdrop, choose from the wide-ranging menu of authentic Italian favorites at this Michelin-recommended restaurant, with each dish lovingly prepared with the heritage of la cucina in mind. This passion for the best of the Italian kitchen, coupled with the magical waterfront setting, is among the reasons Ristorante Il Teatro has captured Forbes Travel Guide's coveted Five-Star Award. Discover fresh and juicy authentic spring flavors from the land and sea. 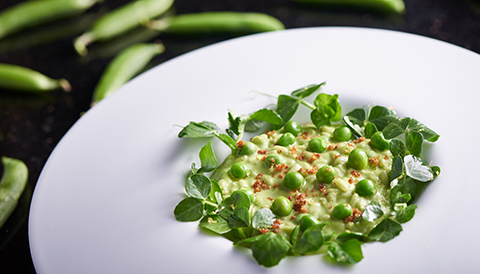 This extraordinary menu showcases seasonal sweet peas, as well as special processed aged one-to-seven-year Carnaroli Rice, premium lobster, lamb loin and veal.